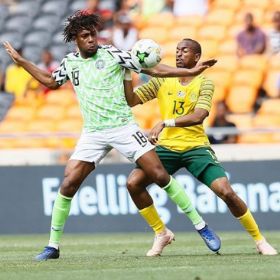 Alex Iwobi has been asked to pick his Ultimate XI Dream Team by Arsenal Media and has included only two Nigeria internationals in his line-up in a 4-3-3 formation. Chelsea legend Petr Čech was surprisingly omitted from the squad, with Colombia netminder David Ospina getting the nod over the current Arsenal second-choice goalkeeper. Chelsea loanee Ola Aina and Nacho Monreal were given the responsibilities of playing in the right and left back positions, while Laurent Koscielny and Per Mertesacker were deployed as central defenders. Iwobi explained that he picked Aina because they grew up together, they both play for Nigeria and have a good chemistry. Iwobi's side contains Santi Cazorla and ex-Arsenal youth teamer Glen Kamara as the central midfielders, with Mesut Ozil as the number ten. The Hale End Academy product selected international teammate Ahmed Musa as the right winger and went for Gabon star Pierre-Emerick Aubameyang as the left winger while Alexandre Lacazette was picked as the number nine.